AgroAtlas - Diseases - Clavibacter michiganensis subsp. michiganensis (Smith) Davis et al. - Bacterial Canker of Tomato. Clavibacter michiganensis subsp. michiganensis (Smith) Davis et al. - Bacterial Canker of Tomato. Kingdom Procaryotae, section Irregular Nonsporing Gram-positive Rods, family Pseudomonadaceae, genus Clavibacter. Corynebacterium michiganense (Smith) Jensen; Cor.miciganense pv.michiganense (Smith) Dye and Kemp. Disease appears as withering and necroses on stems, leaves, and fruits during flowering of plants. Withering begins from the bottom layer of leaves. Edges of these leaves turn yellow and braided. Bacteriosis causes brown ulcers (sometimes with yellow slime) on young sepals, stems, pedicles, and especially on fruit stems. Brown bunches are visible on cross-sectioned diseased bodies of vascular system. White spots appear on fruits of tomato (they turn yellow later). As a rule, these spots often have cracks in the center. Early pathogen lesion of fruits results in their ugliness. Seeds of the diseased fruits darken and lose their germination. Cells of Cl. michiqanensis subsp. michiganensis are straight bacilli, usually 0.6-0.8 x 0.7-1.0 in size. Not moving. Gram-positive. Aerob. On nutrient mediums they develop very slowly. On MPA with glucose colonies appear in 4-5 day, reaching size 2-3 mm in 7-8 days. Colonies are round, raised (colorless, translucent in the beginning, cream-yellow later). Destroying gelatin slowly. Curdling milk. Hydrolyzing starch poorly (not all strains). Not producing indole and N2S. Not reducing nitrates. Producing acid from glucose, saccharose, galactose, maltose (not all strains). The optimum temperature for growth is 25-27.C, growth is absent at 47.C; pH 7.5. Pathogen produces polysaccharides, which have toxic effect on plants and cause their withering. Sources of the infection are seeds and vegetation residues. Bacteriosis is present in the USA, Canada, Italy, Germany, France, Belgium, England, Southern Africa, Australia, and distributed through territory of the former USSR. The temperature 20-28.C and relative humidity of air 80-85% are optimum factors for the bacteriosis development in greenhouses. Distribution of the disease may take the form of epiphytotics in open ground during rainy and hot weather. Pathogen affects plants from the family Solanaceae. Yield losses depend on a cultivated variety. Control measures include optimal agriculture, maintenance of crop rotation, cultivation of relatively resistant varieties, careful removal of plant residues, separating seeds from shrunken grains, pesticide treatment of seeds before sowing, treatment of plants by pesticides during vegetation period. Arsent.eva M.V. 1954. 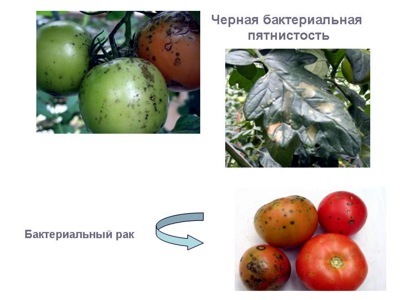 Bacterial cancer of tomatoes in Irkutsk Region. In: Kuznetsova A.I., ed. Novosti sel.skokhozyaistvennogo instituta 6: 71-74 (in Russian). Artem.eva Z.S. 1938. A study of the races of the causative agent of tomato bacterial cancer. Vikhrev S.D., ed. Moscow & Leningrad: Izdatel.stvo sovkhoznoi i kolkhoznoi literatury. V.17, p. 137-140 (in Russian). Bilai V.I., Gvozdyak R.I., Kraev V.G., Ellanskaya I.A., Zirka T.I. & Muras V.A. 1988. Microorganisms are the pathogens of diseases of plants. Kiev: Naukova dumka, 552 p. (in Russian). Bykova G.A. 1992. Biological basis of protection of tomato from bacterioses in protected ground of the North West zone of the Russian Federation. PhD Thesis. St. Petersburg: VIZR, 18 p. (in Russian). Bykova G.A. 1994. Bacterial of disease of a tomato in the protected ground of Northwest of Russia. In: Zakharenko V.A. & Matveeva E.V., eds. Works of All-Union Conference. Bacterial diseases of potato and vegetable cultures and methods of their control. Moscow: RASKHN, p. 62-65 (in Russian). Bykova G.A., Leskova A.N. & Kabashnaya L.V. 1990. Strains of the pathogen of bacterial cancer of tomatoes in the protected ground of the Northwest zone of RSFSR. In: Gvozdyak R.I., ed. Materials of conference. Phytoncides. Bacterial diseases of plants. Part 2. Kiev & Lvov: KGT-2, p. 72-73 (in Russian). Dolzhenko V.I., Kotikova G.S., Zdrozhevskaya S.D., Grishechkina L.D., Burkova L.A., Gerasimova A.V., Milutenkova T.I. & Belykh E.B. 2001. Means of protection of plants by treatment of seeds before sowing. In: Ishkova T.I., ed. St. Petersburg: VIZR, 55 p. (in Russian). Galach.yan R.M. 1950. Affection of various plants by pathogens of bacterial cancer of tomatoes. In: Panasyan A.K, ed. Microbiological collection of works. V. 5. Yerevan: AN Armyanskoi SSR, p. 79-89 (in Armenian). Izrail.skii V.P. & Karpovskaya S.H. 1957. Internal contamination of seeds of tomatoes by bacterial cancer as a factor of distribution of the infections. In: Zheligovskii V.A. et al. Izvestiya VASKHNIL, V.6. Moscow: Izdatel.stvo MSKH USSR: 22-26 (in Russian). Komarova M.S. & Korunets I.V. 1997. Biological means for struggle against bacterioses of tomatoes. Zashchita i karantin rastenii 4: 27 (in Russian). Nosova O.N. 1990a. Studying tomato plants resistance to bacterioses. In: Gvozdyak R.I., ed. Phytoncides. Bacterial diseases of plants. Materials of conference. Part 2. Kiev & Lvov: KGT-2, p. 74-75 (in Russian). Nosova O.N. 1990b. Necrosis of core of tomato stem and basis for its control. PhD Thesis. Moscow: TSKHA, 18 p. (in Russian). Osnytskaya E.A. 1939. Bacterial cancer of tomatoes and measures of its control. In: Khromtsev S.P. Vegetable growing, 2-3. Moscow: Izdatel.stvo sovkhoznoi i kolkhoznoi literatury, p. 38-42 (in Russian). Osnytskaya E.A. 1953. Survival rate of the pathogen of bacterial cancer of tomatoes (Corynebacterium michiganense) in ground. In: Kondakov A.N. & Sergeev V.N. Protection of vegetable cultures against pests and diseases. Moscow: Izdatel.stvo sovkhoznoi i kolkhoznoi literatury, p.68-72 (in Russian). Pavlyushin V.A., ed. 2003. Methodical recommendations on studying bacterial diseases of tomato and measures of their control. St. Petersburg: VIZR, 29 p. (in Russian). Pavlyushin V.A. & Makarov A.A., eds. 1999. Bacterial diseases of tomato and potato and measures of their control (methodical recommendations). St. Petersburg: VIZR, 30 p. (in Russian). Pekhtereva E.Sh. & Matveeva E.V. 1989. Bacteriosis of tomatoes in the closed ground. Zashchita rastenii 8: 42-43 (in Russian). Serebryakov A.I. 1941. Bacterial cancer of tomatoes. Sady i ogorody 3: 18-21 (in Russian). Sidlyarevich V.I. 2001. Fitosanitary situation on vegetable cultures in the protected ground. Zashchita rastenii 5: 9 (in Russian). Sokolova K.M. 1959. From experience of liquidation of bacterial cancer in the Uzbekistan. In: Ivanov E.N., ed. Protection of plants against pests and diseases, V. 6. Moscow: Izdatel.stvo MSKH USSR, r. 45 (in Russian). Photo is published with the kind permission of F.A.Popov (Belarus).